Those last 2 days have been very busy budo wise. On the “nature and nuclear” side nothing to report, life here is as safe and normal as usual except maybe that the air conditioning is not “on” in the trains in order to save energy. And yesterday with over 23° some aircon would have been very nice on the back from Kashiwa. Saturday we has two classes with Senô sensei and Oguri sensei, and Sunday two classes with Nagato and Sensei. Saturday Senô sensei taught in his inimitable manner some apaprently simple moves that I had a hard time to reproduce (as usual). Event though words cannot express it properly I will try my best to set up the technical aspect of it. As you know only personal experience can describe it. uke is grabbing your right wrist and punches. Dodging the attacking fist with your left shoulder you step in to the right and apply shutô while doing a te hodoki on the grabbed wrist. Controlling the right arm of the opponent you continue to walk in and to the rear left of uke transforming the te hodoki in a grab, and lifting and extending the left arm of ule in order to control his balance. Uke is arched backwards and pressure is applied on his lower back by the pressure on his extended left arm. Very technical and soft at the same time. Footwork is capital here (I know this is knew) and the correct angling on uke’s arm to the shoulder allows the control with no strength at all. The whole class was based on this feeling. Lesson: move in a natural manner and get into uke’s space using a kind of koku feeling. Oguri sensei’s class was good for two reasons. first it was the first class I had with him since his heavy surgery and I was pleased to see him again in such a good shape. As usual his fantastic knowledge about the human body; his power on the controls given with a “one body movement” were amazing. I played the uke a few times and even though he is much lighter than me, I was crushed by his body at all time. Once again it is hard to express with words. Technically we did katamune dori and ryômune dori but having said that there is no way to explain his “zero point” control of the body. The hands are controlling your body at all time but you feel it only when you try to move out of the control. Soft power is what comes to mind when experiencing it. It looked simple when watching it but was impossible to do when you tried. Classes like that give you the feeling that the path to perfection is far from reach. Lesson: go down on your hips by stepping backwards and moving your fingers around the grab(s) and rotate your whole body around uke to reach the zero point of balance. Oguri sensei explained to Tanaka san, Akira san and me that at jûgodan level, you do not have to step too much to the rear. It reminded me of the chûtô hanpa. You half apply the technique and uke’s reactions is finishing it for you. Sunday at Nagato sensei’s class we did again some kind of katamune dori with a fist attack. And Nagato sensei used his elbows in an amazing way, going inside or outside depending on uke’s reactions. We did many henka ending with Omote gyaku, hon gyaku, musô dori, O gyaku; pushing on the elbows or in the upper thigh to take uke’s balance. The way Nagato sensei is able to grab the attacking punch from behind his head at the neck level is impressive. This class passed like in a dream. Lesson: develop the flexibility of your wrists and do not finish the movements Uke’s reactions are the solution. The elbows are used freely and they should rotate in all directions together with the footwork to trap uke. Sensei’s class was interesting as we did a lot of playing around a technique by Pedro using the hands, the sword in uke’s obi, tori’s obi, or two swords techniques. Pedro’s technique was some kind of musô dori from a fist attack and applying a kind of take ori/O soto gake. Sensei used that in line going backwards and ending each one of his variations with excruciating pain at the fingers; He said again that his was the way of theTakagi Yôshin ryû. At one point his uke screaming in pain he reminded us of a saying by Takamatsu sensei when he was his uke: “if you still feel the pain it means that you are still alive”. When we began to do sword techniques, sensei also commented on the difference between the sport budo and the shinken budô where surviving is at stake in each encounter. What we do is not what they do and shouldn’t be compared in any way. But for me the main event on Sunday was that I was rewarded a new diploma by sensei that gave me a strange feeling and let me dizzy for the rest of the class. After the bowing, sensei called me in and I kneeled in front of him, and Nagato read the diploma to everyone. So far, I do not know the exact content of the text but it is a reward for my many years in the Bujinkan named “bufû Ikkan shin gi tai”. 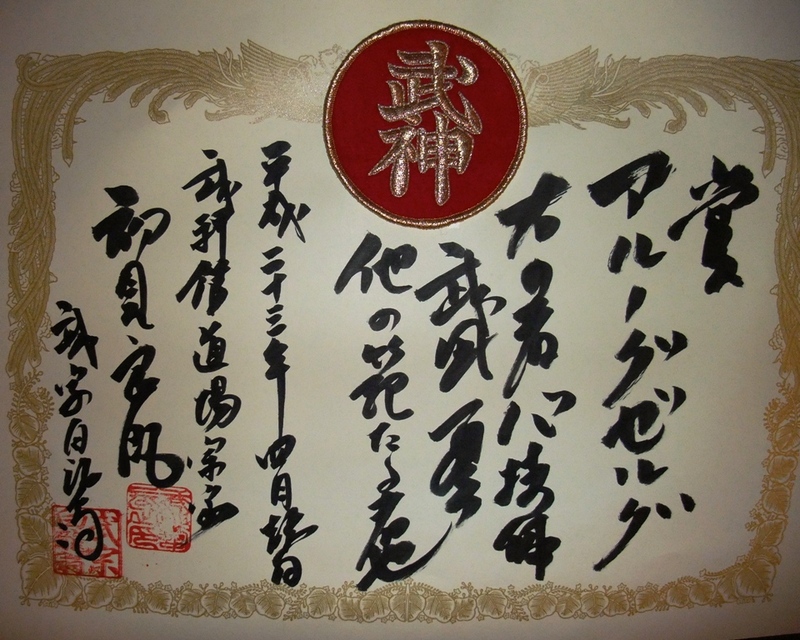 Basically it says that this honorary menkyo is given to me in the name of Hatsumi Sensei and the whole Bujinkan community to thank me for the consistency (bufû ikkan) of my training all over these years in learning the form and the spirit (shin gi tai) of the Bujinkan budô. the diploma is topped with a real golden bujin patch. And this is what is surprising me the most as this is the patch that only sôke is wearing on his gi. I know that we keep repeating “banpen fûgyô” (10000 changes no surprises) but I must admit that yesterday I was really surprised by the really formal way this diploma has been given to me by Sôke but also by the patch attached to it. 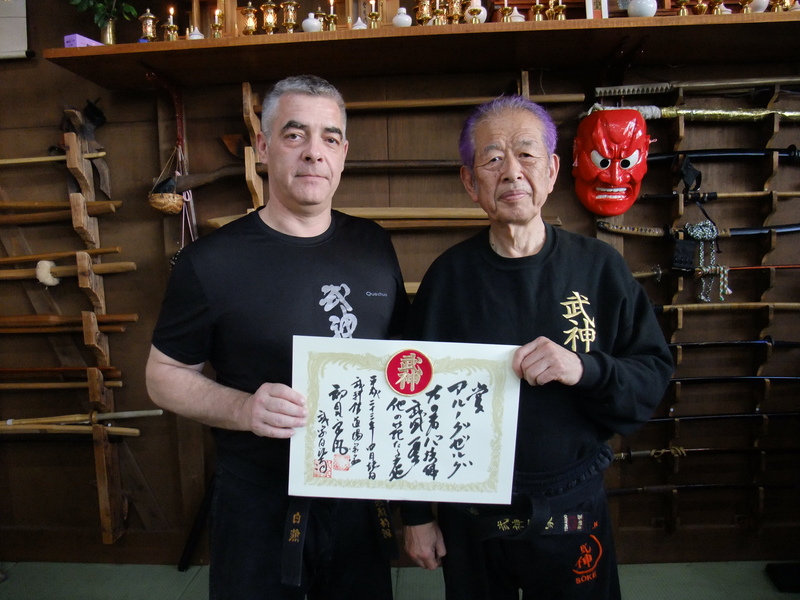 The Japanese Shi Tenno: Oguri sensei, Senô sensei, Nagato sensei and Noguchi sensei received it at the beginning of the year and last February, other old bujinkan members got the same certificate: Pedro, Paco, Natascha, Sheila (and maybe others too). For me this a major honor to receive this new diploma as it represents more than a nice text but also a new responsability. As you know each time we get a new rank we get a heavier weigh on our shoulders, this one is very very heavy. After training, as it is often the case on Sundays, Sensei invited a group of high ranks for lunch and it was a very delightful moment, even more special for me yesterday after this reward. Lots of laughter and happiness were filling the atmosphere and the shoshu was not the only reason for it. Thank you Arnaud and I woluld like to congratulate you because of this award. I am very proud of to be your student! Eres realmente un buen tipo, Arnaud. Y te mereces este y todo tipo de reconocimientos por tu Gran labor en pro del Budo del Sensei Hatsumi. Dices bien con Banpenfugyo. Pero el Sôke siempre consigue hacerlo con nostros… Sorprendernos!!! Muchas Felicidades y mucho Honor llevar esta carga amigo.